CARS.COM — Worst-case-scenario: You just brought home a new SRT Viper and parked it in your driveway to ensure the neighbors got a drool-eliciting look at your ride — made all the more dazzling by that Stryker Red Tinted Pearl paint job for which you forked over an extra $14,600. As karma for your vehicular vanity would have it, a nasty snowstorm hits that night, and by the time you wake up, there’s 4 inches of snow covering your $178,000 supercar. You have to get this thing cleared off ASAP — after all, your neighbors will be leaving for work soon and won’t be able to tell what’s underneath all that snow. First, do not pull out your handcrafted corn-straw broom and start sweeping away or you’ll quickly find that your college-tuition-priced paint job doesn’t have quite the same effect with brush strokes etched into it. The same goes for nylon snow brushes and especially shovels. The recommended tool for this precarious job is a foam brush. A popular one is the SnoBrum, which has a nonabrasive, freeze-resistant molded polyethylene foam brush head with a recessed hard-plastic plate to prevent contact with the vehicle’s surface; it has a steel telescoping extendable handle that extends up to 46 inches for maximum reach. The best way to proceed is to use a SnoBrum (creative spelling of snow broom) to pull, not push, the snow off the car or truck in a straight line from the front bumper by extending your arm as far across the hood as you can, Burgess advised. Keeping all motions in straight lines will ensure that if you do cause a scratch in the vehicle’s paint, it will at least appear to be part of the natural occurrence of your car coming in contact with debris at higher speeds, as opposed to a snow-removal foul-up. You should work from the top of the vehicle down to the sides and then to the hood and trunk areas. The windshield and window glass is hard, so there’s no need to worry about scratching it. Eco Touch Premium Car Care noted that if you don’t have a foam brush handy, you likely have your hands handy. 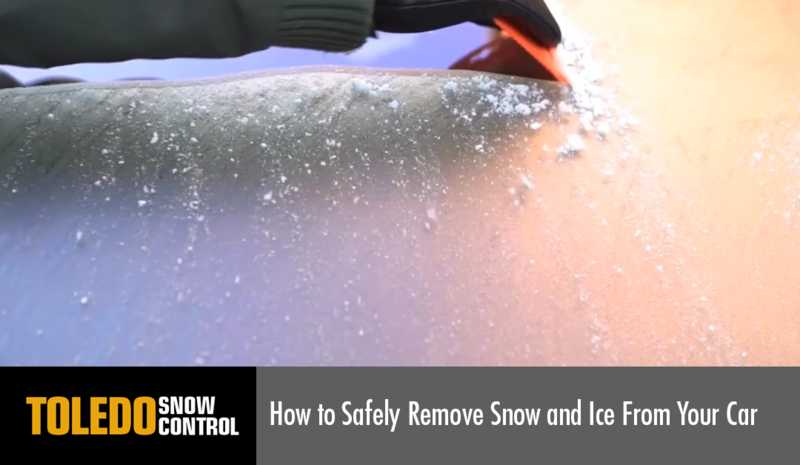 You can always use your hands — preferably leather-gloved — to push the snow off, though your reach will be limited compared with that of a snow brush. Eco Touch also recommended investing in a car cover (keeping in mind that, in heavy snows, the cover can be difficult to remove) and applying a coat of wax to protect the car’s paint from the elements. Jim Dvorak, a spokesman for Southern California-based wax and polish maker Mothers, stressed that planning ahead is important in prevention. Likewise, he said, if the weather is warm enough to wash the car, a spray-on wax can be used after a wash. The interior, he noted, should be protected with all-weather mats, while tracked-in soil should be routinely vacuumed and leather cleaned and conditioned to guard against stains and water damage. Windows should be routinely cleaned inside and out to reduce fogging, as well, he said. Don’t leave your business unprepared for the coming snow. Toledo Snow Control can clear any commercial lot and make sure that you’re open for business. We are proud to provide expert commercial snow removal services in Toledo and all surrounding areas; Bowling Green, Perrysburg, Maumee, Sylvania, Oregon, Holland, Temperance, Bedford and Monclova. GET A FREE QUOTE before the snow comes back!